Exactly as pictured and described. Perfect! Perfect for our bedroom. Loved the color. These pillowcases are perfect for my porch rockers. I love the black and white print and how you can combine different colors and prints with them. They also wash very well. I would buy them again. Loved the Annie Euro Shams that I ordered. I have a king sized bed and I orderd three to go across the bed. They fit perfectly and completely exceeded my expectations. 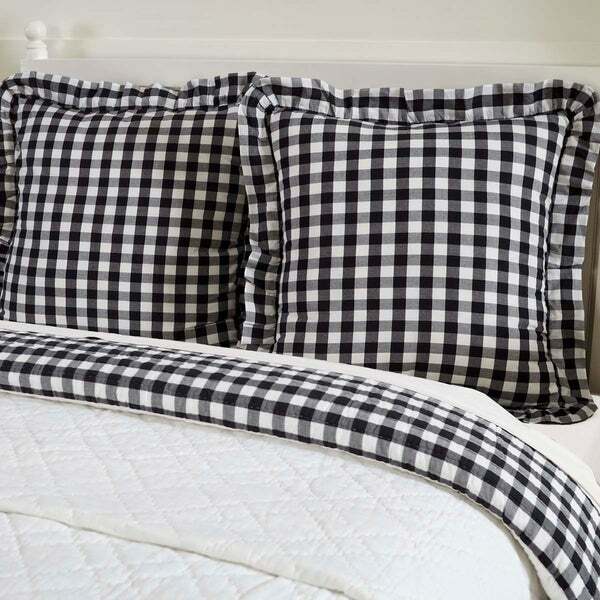 Goes perfect with an older quilt I have with tiny black checks! Coordinates well! Makes it look updated! Excellent quality--exactly like I was hoping they would look and feel. I have two 26 x 26 pillows that I wanted to cover with these and they are PERFECT. So in love with this sham. It’s exactly what I wanted and the tie closure just adds to the cuteness. Great price on these! Love the ruffles. Great price too! could not find in stores so purchased here. Not quite worth the cost but they look good. "Is it 1 or 2 shams?"